I usually post sermons in audio format, and while Christmas Eve’s sermon did record, I’m posting the text. I wrote it as an invitation both to Christmas and to reflection. I think that works better if you can follow along at your own speed. I hope your meal plans have been made or delicious. That your decorations are hung and gorgeous. And that your family is getting along wonderfully, or reasonably practicing civility. Know that I hope Christmas comes with joy and celebrating in your life, however that looks for you. I do have one request, if you will humour me. Take time to stop in front of your creche (if you don’t have one, we have one here that is all of ours). Look at the young mother with her baby, whose husband is not the biological father. They know odd family moments and tension. Picture their surroundings–far from home, w/o family or a proper crib for the babe. They know loneliness, last minute arrangements, and making do. Consider the shepherds who came to visit: unwashed, the dregs of society (just in case someone thought not putting them in the best room was a mistake), bring sheep with them. They know feeling out of place. Think back on the angelic announcement that led the shepherds here. They know responding to a divine call to uncharacteristic behaviour. Look down the road and see if you can spot the Magi, making their way from afar. They know risking much on nothing but hope. Look up at the angels, singing for a newborn. The only ones who already sea king. They know joy and celebration. It is my sincere and deep hope that Christmas come with joy, peace, and love in your lives, every year and especially this year. 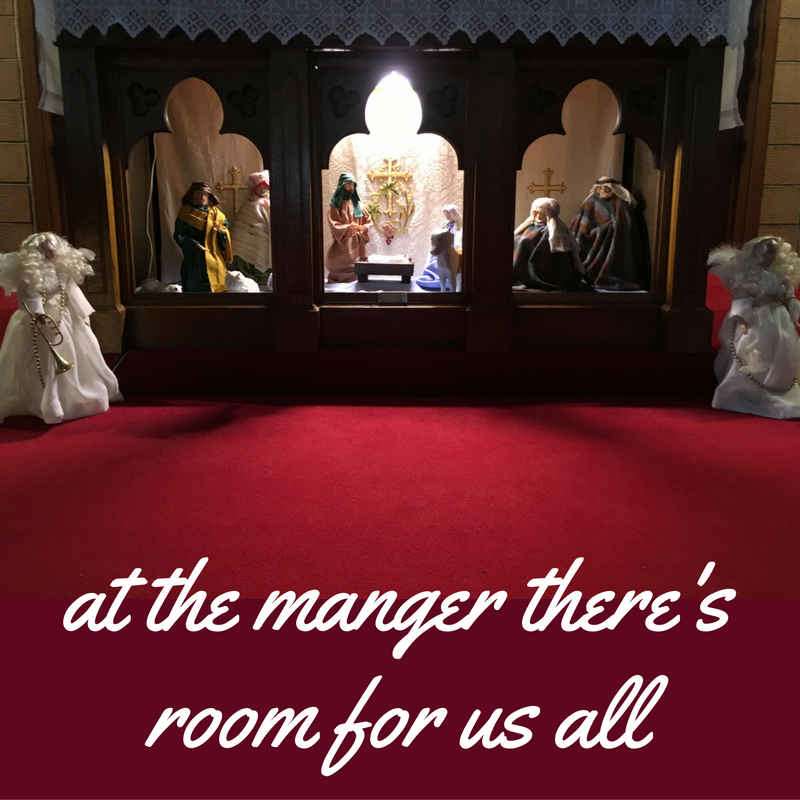 But know, as you take this moment in front of the creche, there is space for all of us, in all our states around the manger. The Christ Child came for and amidst all the strange, hard, demanding, and wonderful moments in our lives.